(CBS/KTHV/AP) JONESBORO, Ark. - The West Memphis Three, a group of men convicted of killing three 8-year-old Cub Scouts and dumping their bodies in an Arkansas ditch changed their pleas Friday, resolving a year-long effort to win their freedom. Damien Echols, Jessie Misskelley and Jason Baldwin agreed to a legal maneuver that lets them maintain their innocence while acknowledging prosecutors likely have enough evidence to convict them. They were freed immediately after the plea. 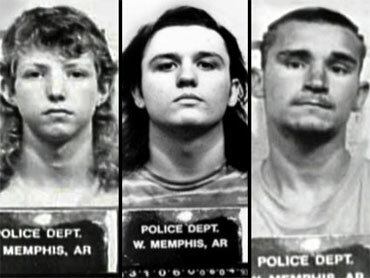 In 1994, the men were convicted of killing Steve Branch, Christopher Byers and Michael Moore a year earlier and leaving their naked bodies in a ditch in West Memphis, Ark. Echols was sentenced to death while Misskelley and Baldwin were ordered to spend the rest of their lives in prison. All three of the men have maintained their innocence. "I am innocent of these charges but I am entering an Alford guilty plea," Echols told the judge. Baldwin and Miskelley also reasserted their innocence. The three were credited with time served, and Echols is being freed from Arkansas' death row. They were placed on 10 years' probation and if they re-offend they could be sent back to prison for 21 years, Prosecutor Scott Ellington said. Baldwin and Echols each pleaded guilty to three counts of first-degree murder. Misskelley pleaded guilty to one count of first-degree murder and two counts of second-degree murder. The Alford plea allows the men to maintain their claims of innocence. Echols' wife, Lorri, sat in the front row of a crowded courtroom, next to Pearl Jam frontman Eddie Vedder, who became a key supporter of the men after watching a pair of HBO documentaries about the case. Vedder put his arm around her during the proceedings. Police had few leads until receiving a tip that Echols had been seen mud-covered the night the boys disappeared. The big break came when Misskelley unexpectedly confessed and implicated Baldwin and Echols in the killings. Defense attorneys claim police took advantage of his low IQ. Last fall, the three men won new hearings from the Arkansas Supreme Court which was more than 15 years after they went to prison despite little physical evidence linking them to the crime scene. Their attorneys point to new DNA evidence that they say should help exonerate the three men. When asked about the plea Echols told reporters, "It's not perfect, not perfect by any means," reports CBS affiliate KTHV. He says they can still follow and bring up evidence to prove their innocence and now from the outside. Echols says he's been in solitary so long, this is overwhelming, according to the station. Baldwin says he didn't want to take the deal but "they're trying to kill Damien." He says he had to think of Echols. Echols and Baldwin hugged after Echols thanked him for taking the plea mostly for him even though he wanted to continue fighting for his innocence. Prosecutor Scott Ellington says that this plea brings this case to a resolution and prevents them from suing the state in a civil case. He also says that he believes that this case is closed and nobody else besides the three men are responsible for the murders. However, he says that they would have been likely acquitted. Ellington says, "Only time will tell whether this was the right decision on my part." He says that he feels it is the best decision and their time served is appropriate with the evidence, reports the station. MEDIA: Star support for the "West Memphis Three"